Last week, a group of Northwest senators announced that the U.S. Army Corps of Engineers will soon begin replacing tribal housing lost decades ago when dams were built along the Columbia River and rising waters forced many people to relocate. Both of Oregon's United States senators -- Ron Wyden and Jeff Merkley-- joined with Washington U.S. Sen. Patty Murray to announce on Feb. 13 that the Corps has dedicated up to $1.6 million for a village development plan to replace tribal housing lost during construction of The Dalles Dam in the 1950s. "With this funding, we are beginning to right this historic wrong for tribal members," Sen. Merkley said. "Leaving our tribes displaced, without relocation assistance, was simply wrong. We are another step closer to making good on the federal government's obligation for housing and infrastructure. I will continue fighting to honor this decades-old promise, ensuring tribal members have the safe, reliable housing they deserve." The Corps plans to set aside an additional $1.5 million for housing, although the second fund depends on congressional action for the remainder of fiscal year 2017. According to a spokesman for U.S. Sen. Ron Wyden, many details of the project are yet to be determined. "I am told no site has yet been chosen, but that it's down to three possible sites on the Washington side (of the Columbia River)," said Hank Stern, press secretary for Sen. Wyden. "Currently, the Army Corps is working with the tribes to determine the location, type of buildings, and other details; that planning work will continue through fiscal year 2019," added Sara Hottman, state communications director for Sen. Merkley. In the 1930s, construction started on a series of dams along the Columbia River. The eventual building of The Dalles Dam, Bonneville Dam and John Day Dam displaced members of four Columbia River tribes: Confederated Tribes of the Warm Springs Indian Reservation; Confederated Tribes of the Umatilla Indian Reservation; the Nez Perce Tribe; and the Confederated Tribes and Bands of the Yakama Indian Nation. These tribes have treaty-protected rights to fish along the Columbia River in their usual and accustomed places. The Dalles Dam was completed in 1957, and the reservoir behind the dam submerged the famous Celilo Falls, a river landmark and major fishing area that had been considered the economic and cultural hub of tribal members in the Columbia River Gorge region. Celilo was also reported to be the oldest continuously inhabited settlement in North America. The 60th anniversary of the completion of The Dalles Dam comes up next month, as reflected in this entry regarding the dam in Wikipedia: "On March 10, 1957, hundreds of observers looked on as the rising waters rapidly silenced the falls, submerged fishing platforms, and consumed the village of Celilo." Oregon's two senators have been among those working to address the need for adequate housing and infrastructure for the displaced tribal members and their fishing access sites. several non-tribal communities that were inundated when the dam backed up the waters of the Columbia River did get federal assistance. In recent years, a series of tribal in-lieu sites have been designed and built by the Corps, mainly for daily in-season fishing access and temporary camping. But many tribal members have been using the sites for long-term or permanent residences. 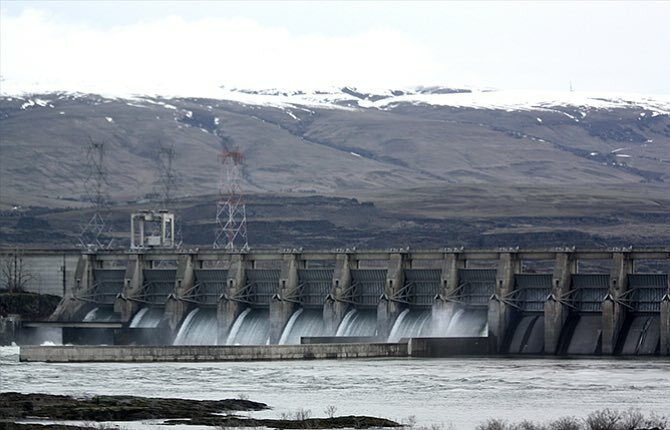 Hottman said Sen. Merkley intends to continue pushing to provide funding to ensure the Lower Columbia River tribes have sufficient housing to compensate for what they lost when the dams went in. "Sen. Merkley is determined to secure remaining funding for the authorizations in the Water Resources Development Act of 2016 and Water Infrastructure Improvements for the Nation Act," Hottman explained. "The senator has said it is unconscionable that tribes were displaced without relocation assistance, and will continue fighting to ensure funds are dedicated to safe, reliable housing for Native families."